Hearson, M, 2018. Transnational expertise and the expansion of the international tax regime: imposing ‘acceptable’ standards. Review of International Political Economy 25(5):647-671. We are living through a period of instability and change in the international tax regime, perhaps unprecedented in its depth and duration. It’s driven by economic and political changes, such as austerity politics, the digitisation of the economy, and the rise of China and other emerging powers. To understand the impact of these pressures on the institutions of tax cooperation, we need to know how the politics at international level works, and we have two complementary lenses to do so. One focuses on conflicts and alliances between states with different preferences: developed versus developing, offshore versus onshore, US versus Europe, and so on. The other takes a sociological approach, studying the transnational policy community that makes international tax rules and its interactions with other actors such as politicians and campaigners. To explain why the OECD, G20, EU or UN have reached a particular conclusion, we probably need to use both of these lenses. But how do states arrive at their national positions? Those positions set the parameters for subsequent transnational discussions, but they also determine if and how states will implement international agreements. For example, with whom will they negotiate bilateral tax treaties, and on what terms? The same sociological lens is important here, because national tax policy is made by a community of people, many of whom are also involved in tax standard-setting at the OECD and elsewhere. At both national and international levels, international tax has historically been an obscure topic, the preserve of this small community of experts. Every so often – as in recent years – the community faces a conflict with others who aren’t steeped in the principles underlying the tax system, nor its technical details. Such conflicts can play out at the national level, as well as in the transnational sphere. Often it was the UK, rather than its developing country negotiating partner, that initiated and drove forward negotiations. The UK’s aim was to reduce the tax paid by British businesses abroad, making them more competitive in comparison to firms from other countries. So we can’t explain the expansion of the international tax regime into developing countries solely through a focus on developing countries’ actions. Tax experts, from the Inland Revenue and the business community, dominated policy formulation. They saw tax treaties as a means to lock developing countries into ‘acceptable’ OECD tax standards, a long game designed to protect British businesses from anything unconventional. Meanwhile, their non-expert counterparts in other government departments and businesses had different priorities derived from a focus on short-term tax gains. They were mostly unable to influence policy, however, indicating that business power over tax policy depends a lot on expertise. I’ve uploaded all my photographs from the archive files that I cited into a zip file (warning: it’s very large: 660 pages and 273MB). Below is a selection to illustrate the argument. Memo from Alan Lord, 1976. Click to see the whole document. Here is an extract from the minutes of a typical meeting between the Inland Revenue and tax professionals from British businesses. As can be seen, businesses are being consulted not just about which countries to negotiate with, but also about the sticking points in individual negotiations – in this case Malaysia. 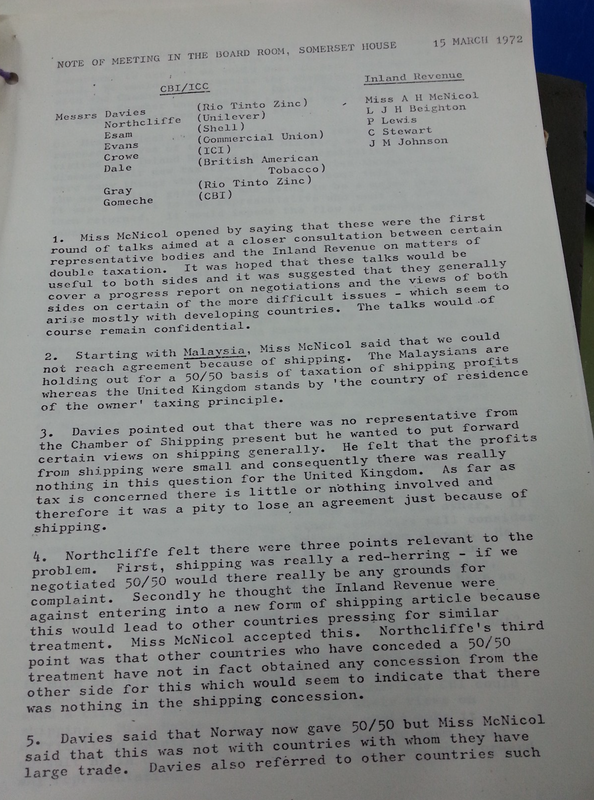 Minutes of a meeting between Inland Revenue and representatives from British businesses, 1972. Click to enlarge. Below is one of my favourite exchanges, from a few months later. In contrast to the open attitude to the CBI tax committee, the same Inland Revenue civil servant (Ann McNicol, now Ann Smallwood) refuses to share even a list of current negotiations with other departments. 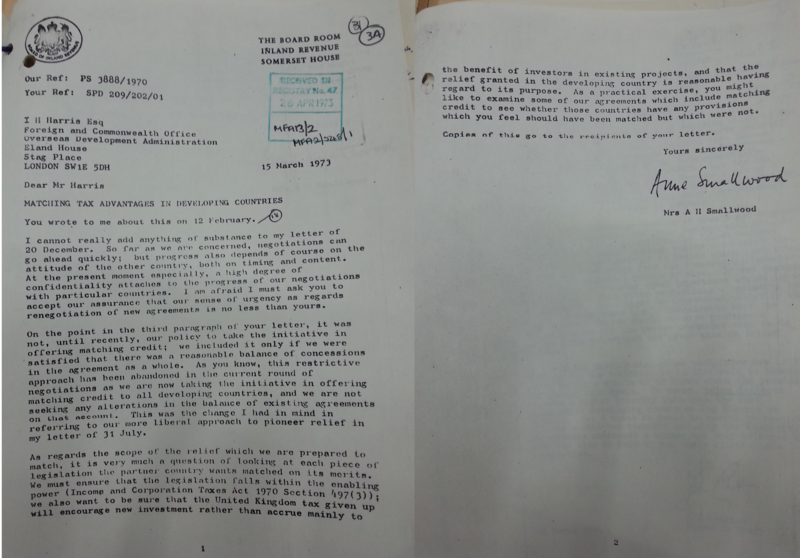 Extract from a letter from Smallwood, Inland Revenue, to Harris, Foreign and Commonwealth Office, 1973. Click to see the whole document. Smallwood’s letter provokes a round of very angry memos within those departments, of which this is a good example. 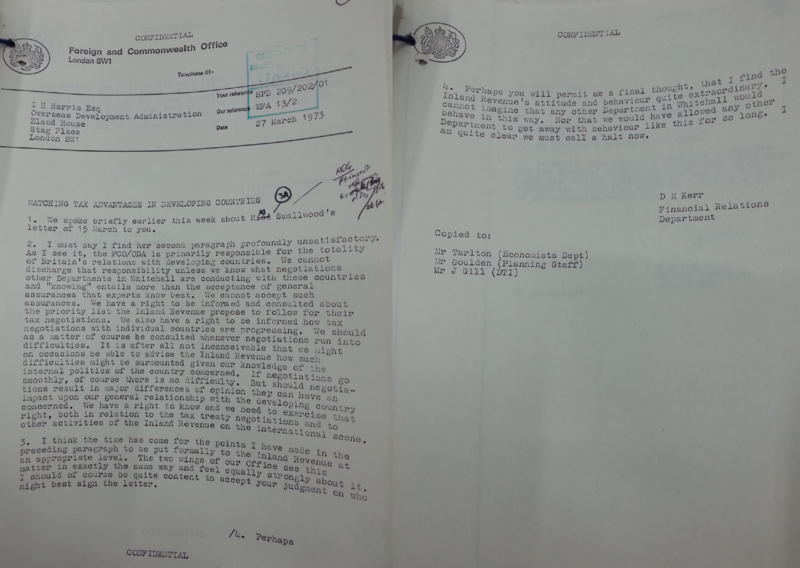 Extract from a memo by Kerr, Foreign and Commonwealth Office, 1973. Click to see the whole document. A particular bone of contention between the two groups (Inland Revenue and the CBI tax committee on the one hand, Foreign Office, Departments of Trade and Industry, and their business interlocutors on the other) was the stalemate in negotiations with Brazil. In the paper I show how the tax experts in business and the Inland Revenue did not want to set what they saw as a bad precedent by caving in to Brazilian demands to sign a treaty that contravened OECD standards. They came under strong pressure to sign a treaty “at any price” from business lobbyists who thought UK firms were losing out to German and Japanese competitors that did benefit from treaties with Brazil. The consequence, as Smallwood put it in 1975, was that business “spoke with two voices”. Extract from a memo by Smallwood, Inland Revenue, 1975. Click to see the whole document. The European Union’s tax treaties with developing countries: leading by example? Yesterday a report I wrote for the European United Left/Nordic Green Left (GUE/NGL) group in the European Parliament was published. It was used as input for a hearing of the Parliament’s TAX3 committee, at which Hannah Tranberg from ActionAid, Eric Mensah from the Ghana Revenue Authority and UN Tax Committee, and Sandra Gallina of DG Trade spoke. (This link is to a video of the hearing, which begins with Margaret Hodge and Tove Ryding discussing Brexit, then moves on to the tax treaties discussion at around 16:30). When the GUE/NGL approached me about working with them on this report, I jumped at the chance. It uses the Tax Treaties Dataset, a project funded by ActionAid and launched in 2016. Earlier this year I had used much of the same analysis in a European Commission workshop for treaty negotiators, and the comparative element certainly caught some of their attention. Just last week I used the dataset at a workshop of African treaty negotiators organised by the Organisation Internationale de la Francophonie, at which it helped them to begin the process of analysing their treaty networks and developing renegotiation strategies. The report has two main messages, from my perspective. The first is that, while the recent attention paid to treaty shopping is most welcome, the basic balance between ‘source’ taxing rights – which allow countries to tax inward investment from the treaty partner – and ‘residence’ taxation in tax treaties with developing countries is also a problem. The dataset, which includes over 500 tax treaties signed by developing countries, includes a measure how much of a developing country’s source taxing rights each treaty leaves intact. It turns out that EU treaties remove more source taxing rights than average, even when compared with other OECD members. What’s more, the difference is growing. Source/residence has been the elephant in the room in the debate over international tax rules in recent years, as we saw when it was dropped from the BEPS process at an early stage, only to re-emerge in the context of digital taxation. Countries conducting ‘spillover analysis’ or otherwise analysing their treaty networks need to take this into account. Conduct spillover analyses incorporating reviews of their double taxation treaties, based on the principle of policy coherence for development and taking into account guidance from the European Commission and other bodies. Undertake a rolling plan of renegotiations with a focus on progressively increasing the source taxation rights permitted by EU members’ treaties. Reconsider their opposition to a stronger UN tax committee, as the Parliament has previously requested. Formulate and publish an EU Model Tax Convention for Development Policy Coherence, setting out source-based provisions that EU member states are willing to offer to developing countries as a starting point for negotiations, not in return for sacrifices on their part. Hearson, M, 2017. The UK-Colombia Tax Treaty: 80 Years in the Making. British Tax Review (4):375-384. Today at 2.30pm, the UK parliament’s Third Delegated Legislation Committee will debate tax treaties with Lesotho and Colombia. It will be interesting to see how much debate really takes place, a matter on which I’ve commented before once or twice. The hearing gives me a chance to plug my article in the British Tax Review last year [pdf], which traced the UK’s attempts to obtain a tax treaty with Colombia over 80 years. Its overtures were frequently rejected, at first because Colombia was not interested in tax treaties, then because it was bound by the terms of the Andean pact, and finally because it could not agree on terms with the UK, especially over technical service fees, an area where the UK position has changed. Since the article was published I had the chance to speak with a Colombian tax official, who told me that Colombia’s change of heart on technical service fees is a change of view about tax policy, rather than a concession forced by OECD membership, as I speculated in the article. Of course, the two developments might not be totally independent. The demands of OECD membership, combined with the unusually liberal use of MFN clauses during an era of less-than-strategic negotiation, seem to have backed a country once insistent on a “red line” over technical service fees, and before that sceptical of accepting the limitations on its taxing rights that come with a tax treaty, into a corner. Having been constrained in its negotiating position by the pro-source taxation stance of the Andean community, Colombia now finds itself pulled in the other direction by the OECD. Is this further proof that the world is moving inexorably towards an OECD-type tax system? The gradual but steady expansion of the OECD, given a fillip most recently by the announcement that Brazil would begin accession talks, might lead us to such a conclusion. In contrast, however, the continued expansion in the use of the technical service fees Article by developing countries, together with its imminent introduction into the UN Model Treaty, point towards a growing divide between states on this topic.